The Earth is one individual living within the greater cosmos. Isaac Newton proved the law of gravity stating that the earths gravitational pull is related to the orbit of the Moon. It has naan found that the moon directly affects the tides, this also affects the tides of groundwater. 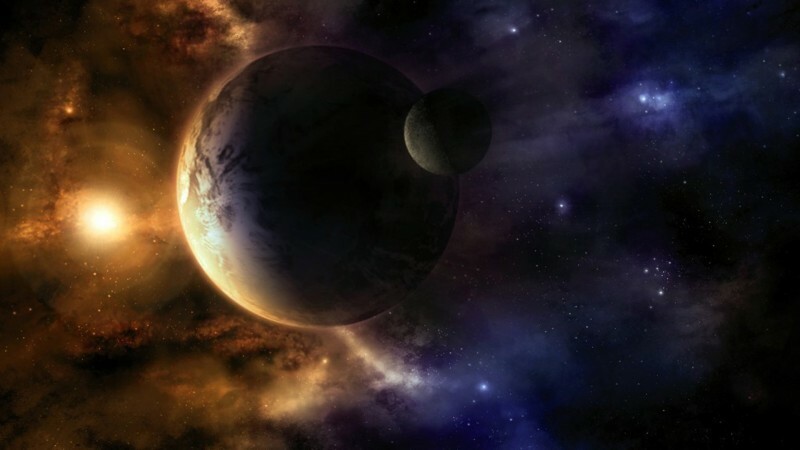 When there is a new moon, both the moon and the sun are on the same side of the earth, pulling roots deeply into the soil through the pull of gravity. In biodynamic farming his time is believed to be good for pruning branches, picking flowers and fruits, anything that has to do with the outer part of the plant since much of the energy of the plant is going to growing and nourishing the roots at this time. The opposite is true for when the moon is full, during this time the moon is on one side of the earth and the sun, the other side, creating more of a balance, and since the moon is the next closest body to the Earth the gravitational pull is much stronger. This brings the energy of the plants up into the branches. Plants have been found to uptake more water during a full moon phase. Leaf growth is alive because of uptake water and nutrients as well as increased moonlight that encourages the plants to continue growing and photosynthesizing light reflected by the moons surface. On top of all this the moon also hold an astrological sign depending on the placement in the sky. This sign changes about every other day. The signs each resemble an element, either fire, earth, water, or air. Earth is said to depict roots, Fire correlating to seed production, water pertaining to leaf growth and air is flowers. Each one allowing us to be one with the rhythms of the surrounding cosmos and the natural earth, giving us insight on what part of each plant to focus on that day whether it be harvesting, planting, or collecting seeds, biodynamics helps connect people and the earth on an even greater level. 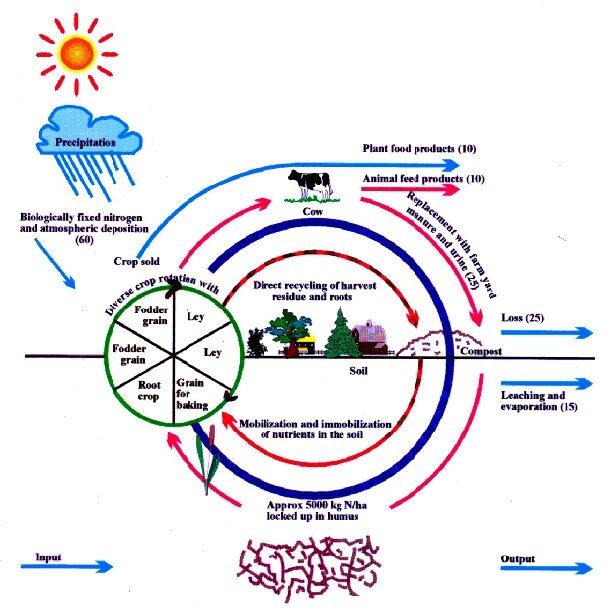 Biodynamics Farming works closely with natural cycles, including weather patterns, lunar and solar patterns, and animal systems. Above is an example of how a Biodynamic Farm System works in varying levels. Biodynamic Farming has it's own set of foundation "principles" to guide them throughout the process. Biodynamic preparations elicit a wide range of reactions from “hogwash” to “intrigue” to “participatory meaningful connectiveness.” Perhaps what I have personally appreciated about biodynamics, over the 36 years that I have been making and using the preparations, is that biodynamics has helped me keep an open awareness of the mysteries of life that lie beyond, and are embedded in, the material world. The premise behind biodynamics is that life processes cannot simply be reduced to chemical and physical reactions, but that within what is scientifically observable there are non material forces at work. These forces being non-material can be called “spiritual,” though, of course, that is a loaded term. Within our materialistic Western culture, biodynamics has not been widely adopted, not because it doesn’t work, but because it doesn’t make sense to conventional thinking. The preparations can be viewed as healing remedies for the Earth. It is painfully clear that our planet is in the need of our attentive care and the biodynamic preparations are one way for us to fulfill our role as healers through our agricultural activities. When working with the biodynamic preparations we are harnessing the life forces in a way that allows them to act as catalysts to enhance the health and balance of our farm. These preparations take much care to make, and being mentored is the best way to learn. Many regional biodynamic groups, including the Oregon Biodynamic Group, welcome newcomers to join them to learn how to make the preparations. Most biodynamic practitioners don’t make their own preparations because it is a time-consuming activity, but instead elect to purchase them from a regional group or the Josephine Porter Institute. The six compost preparations are made from specific herbs: yarrow flowers, chamomile blossoms, the whole areal portion of the stinging nettle while in flower, oak bark, dandelion blossoms and valerian flowers. Four of these six preparations are enveloped in sheaths of animal organs. All are made with a sensitivity to the rhythms of the sun and zodiac. All but one are buried in the ground for a specified period of time. When the preparations are finished, they have the appearance of well-ripened compost, with the exception of the valerian preparation, which is in a liquid form. The compost preparations are easy to use. Upon the completion of building a well-made compost pile, six holes are placed at 45-degree angles that reach toward the center of the pile. One teaspoon of the yarrow, chamomile, nettle, oak bark and dandelion preparations are inserted into their own hole. One-quarter teaspoon of the valerian preparation (which is fermented valerian flower juice) is stirred for 10–15 minutes in a gallon of good-quality water (rainwater is best, spring and well water are fine, chlorinated water should be allowed to sit for several days in the sun prior to use). The method of stirring is specific, repeatedly creating a vortex in one direction, followed by a vortex in the other direction. Demonstration is the best way to learn how to stir. Half of this solution is poured into the remaining hole. All of the holes are closed, and the remaining ½ gallon of the valerian preparation is sprayed over the entire pile. Amazingly, this one “set” of preparations can treat up to 15 tons of material as the “work” is being done by non material means. Higher potency homeopathic remedies are similar in that the physical atoms of the “mother” material are no longer present, but the effect of the forces are present and strengthened. 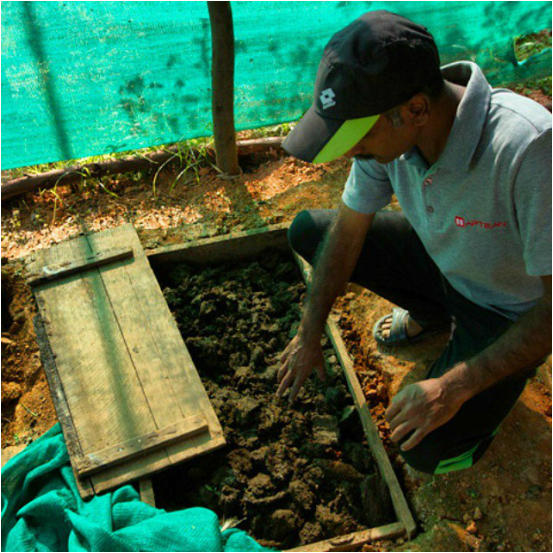 The preparations do have an observable effect on the fermentation process of the compost pile. They moderate the temperature curve of the thermophylic stage, by slightly slowing the temperature’s ascent, keeping the peak temperature slightly lower and holding the warmth in the pile longer than when not using the preparations. The compost preparations assist in creating a finished compost with excellent humus structure. The effect of the compost preparations continues when the compost is spread on the soil, making the soil more sensitive to cosmic rhythms (especially those of the planets and the moon). They also work in a myriad of ways to help balance life processes, especially in the way that fertility is made available to the plants. The inspiration behind biodynamics and the initial indications for making and using the biodynamic preparations were given in a series of lectures given by Rudolf Steiner in 1924. These lectures are available in the book Agriculture, which is available in two translations. Other books recommended for further study of the biodynamic preparations include Grasp the Nettle, by Peter Proctor, and Manfred Klett’s Principles of Biodynamic Spray and Compost Preparations. These titles and others are available through SteinerBooks. The study of biodynamics can become a lifelong process with questions usually arising at a far greater rate than seemingly definitive answers. But there is a calm that can come from knowing that we don’t know and realizing that we are all part of something far greater than ourselves.